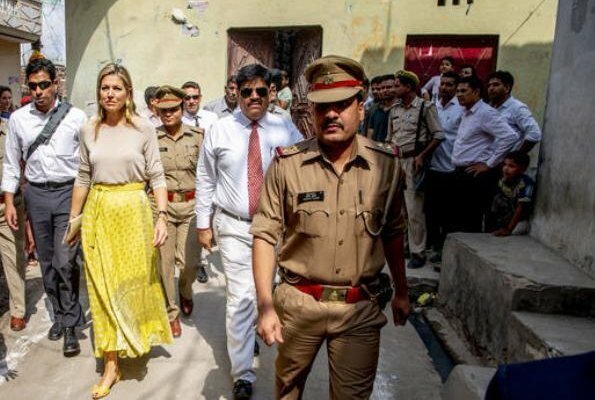 On the second day of her visit to India, Queen Maxima of The Netherlands visited a Cricket Factory, who got a loan from Aye Finance in Meerut in Uttar Pradesh on May 29, 2018. The Queen talked to the workers living in Pink Ball. Queen Máxima is the special ambassador of Secretariat General of UN for extensive development financing. Maxima's hair color and texture is not good, unhealthy. Do not care for the huge yellow earrings. Lovely skirt -- flowy, feminine and looks cool on a hot day. I think the top coordinates poorly with it, though. Today she is on a working mission 'in the field' so to speak, so it isn't about fashion as far as I'm concerned. As long as she is dressed appropriate to the customs of the diverse culture, environment and especially the weather, she's OK and to me she is perfectly fine on all 3 counts. Cool breathable fabrics, degrees of modesty, and a cool long skirt. I like that her earrings are very culturally appropriate (as anyone who is familiar with 'Indian jewellery sets' will understand), and this time her hair gets a pass. It was well over 40C in New Delhi during the day and she was outdoors. I am very impressed with her dedication and commitment to her work - not only here but elsewhere too - combining her professional career with their royal status to promote causes; so too with Mary and Rania. MM and Meghan also have similar qualifications and potential for this kind of work. It seems to me she would have been much more comfortable with her hair pulled back in a pony tail or something like that, in 40C heat. Many of the royals seem to have a busy schedule, perhaps that affects on hair etc. Just hope they’ll cope and don’t get overworked. I would have cosen another top that looked better with the skirt but also that was cooler in that warm climate. Q Maximas outfit today in India is very nice I like the combination,other earrings would have made a better Statement, like this it is to much yellow for me at least. Love the skirt - bright and cheerful, appropriate to both the climate and local customs and practical for a working visit out and about. Not sure about the top - it looks a bit warm but it's fine. I don't mind the earrings, they're a bright coordinating pop of colour. She has problem hair anyway so I'm sure the climate isn't helping. I would probably have put it up if it were me. Esto se va pareciendo a un blog politico, cada uno hace su propia propaganda en funcion de sus simpatias. I think she nails it here. She manages to be modest and still neat enough. It used to be you couldn't hide under an anonymous comment. I find it annoying since there's so many anonymous now and we don't know who's who. Den la cara y no se escondan! I like Maxima's skirt but not the top, especially in that heat. Her hair, like Victoria's is almost always critisized with good reason. Totally agree - don't understand why it's started happening so much recently. Queen Maxima of the Netherland looks very wonderful.